A day out at Chatsworth House is one of the most popular days out for families on holiday in the Peak District. The 35 000 acre Chatsworth Estate includes the famous Chatsworth House, which is the home of the Duke and Duchess of Devonshire, the Gardens, and Farmyard. 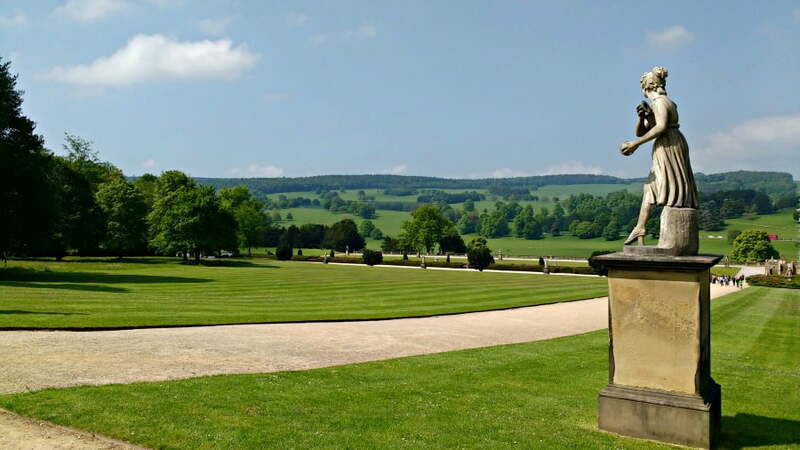 Also known as the ‘Palace of the Peak’, the Chatsworth estate is set in a breathtaking location, surrounded by the gentle rolling hills of the Peak District and a few miles from Bakewell. We spent a whole day exploring the Chatsworth Gardens and Farmyard to see what Chatsworth was like for toddlers. Visitors to Chatsworth can choose to visit the House, Gardens and Farmyard, and can buy tickets to visit all or just one of these places. It was a warm, sunny day when we visited so we decided to take a picnic, and visit the Gardens and the Farmyard. On a sunny day, you can spend a whole day just exploring the gardens of Chatsworth House. The garden is spread over 150 acres and includes formal gardens, woodland walks, ponds, waterfalls, a rockery and a maze. 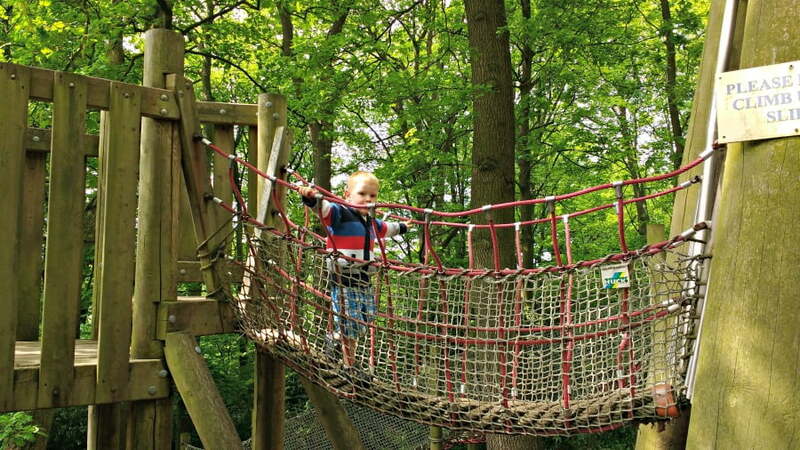 If your toddler loves running around and exploring outside, this is the place for you. There are sticks to find, trees to hide in and hills to roll down – everything you need for a perfect day out for a toddler. There are plenty of paths which are suitable for pushing buggies around the Gardens. Our highlights from our visit to the Chatsworth Gardens include the Cascade flowing down a steep hill in the Gardens – the toddler wanted to have a paddle in it but there are signs asking you not to. 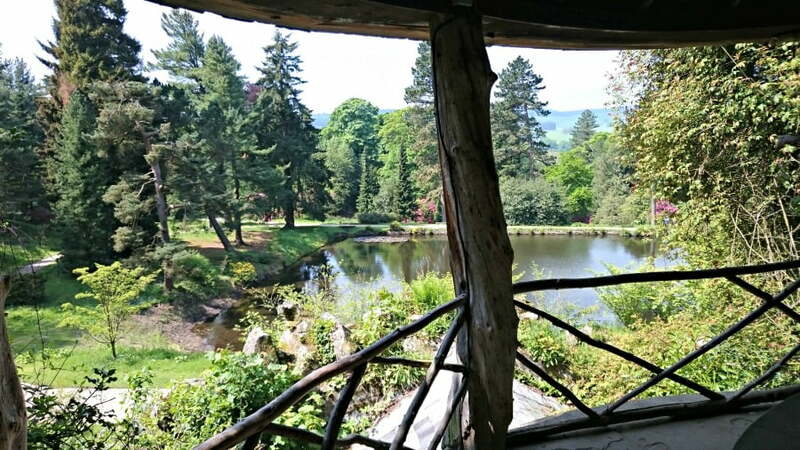 The Grotto House is where the Devonshire family used to go to relax – there are fantastic views of the Grotto Pond from the Grotto, and a few nooks and cranies to hide in! The Canal Pond is a canal shaped lake from where you can see the House at the far end. Near to the house is the Emperor’s fountain which was created for a visit by the Tsar of Russia, who ironically never came. Against the backdrop of the House, the fountain reaching up high into the sky is a stunning sight. 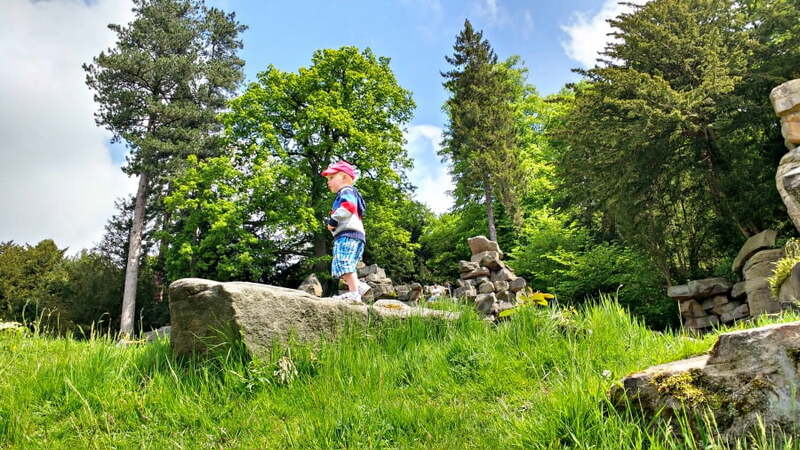 Paxton’s Rock Garden – great for older toddlers to practice rock climbing! There are some quite steep drops so younger toddlers will need to be watched carefully. The River Derwent runs along the bottom of Chatsworth Gardens – this is a great spot for a picnic as you can watch the sheep grazing at the other side of the river. After a riverside picnic in the Gardens, we spent the afternoon at the Chatsworth Farmyard. The Farmyard was opened in 1973 to show children where their food comes from, and how the land at Chatsworth is managed. 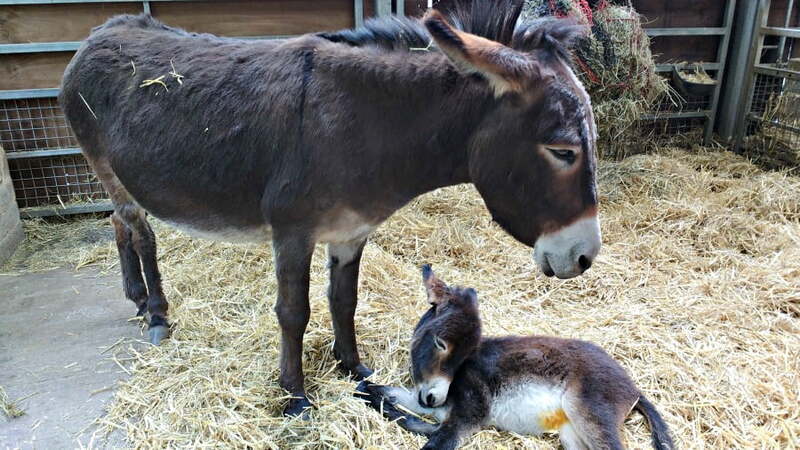 There are pigs, donkeys, chicks, sheep and goats for babies and toddlers to see, plus various interactive demonstrations throughout the day. These include milking the cows, animal feeding and animal handling. The new Guinea Pig Village is very popular with children and lets children see these cuties, as well as having the opportunity to hold them. There is a tractor ride on area with tractors of various sizes for toddlers to ride on. 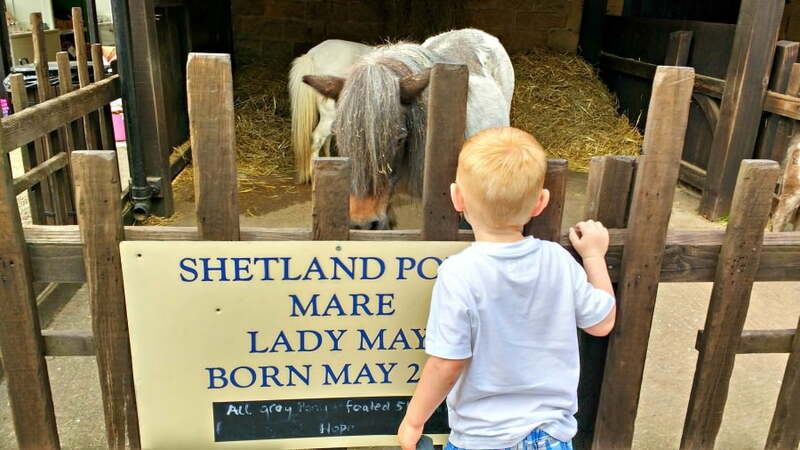 Another highlight of the Farmyard was the amazing adventure playground which is included in entry price. This massive play area has areas for children of all ages, including a separate area for toddlers, and a large sand and water play area. 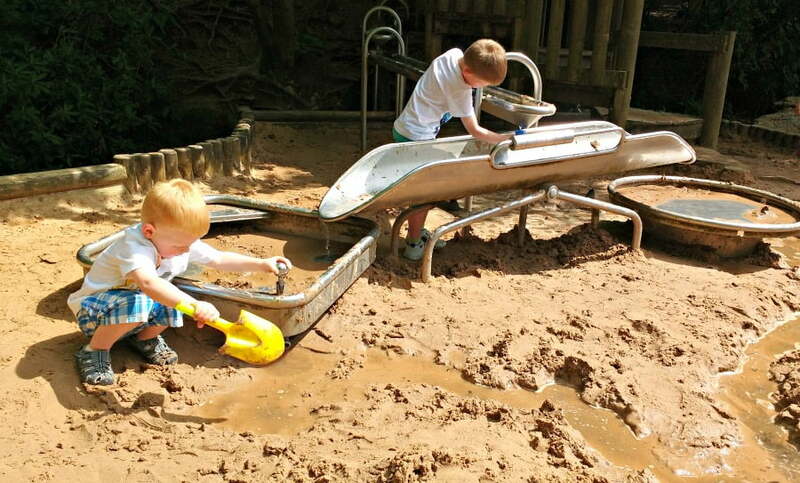 You could spend a whole day in the adventure playground – especially as it has toilets and a snack bar onsite. · Parking is £3 but there are parking attendants so you don’t need correct change. · Pushchairs are not allowed in Chatsworth House, but baby carriers can be borrowed and pushchairs stored. · For prices for the Chatsworth House, Gardens and Farmyard click here. Children aged 3 and under are free of charge. · Dogs are welcome on leads in the Garden and Park. 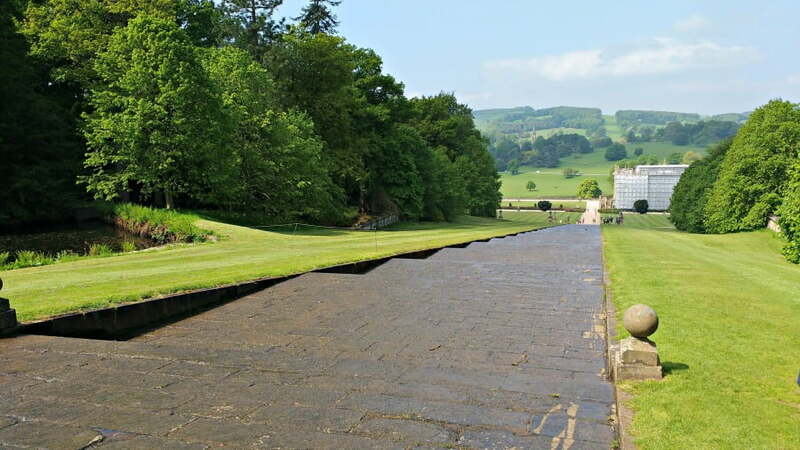 · For more information about a day out at Chatsworth visit the Chatsworth website.